It’s race time in Copenhagen this Saturday 24th August! An open competition for all who ride a cargo. Many fun races, prizes and also fun for spectators too. Bring your friends, your Omnium/Bullitt/Christiania/Oldtimer etc and join in. Registration on the day from 11:30 – 50DKK to race, free to watch. We’ll race for the Danish Championship title in Two Wheeled and Three Wheeled, as well as Oldtimers (vintage cargo bikes) – all races featuring a Men’s and Woman’s category. The Team Relay (4 persons) – mixed bikes and mixed Men/Woman. There will be rolling action on the course between 13:00-17:00 on race day. Everyone is welcome to participate. The race is not just for sporty types. All nations welcome! A number of companies and volunteers are behind the organisation of the Svajerløb. It is a not-for-profit event and for all involved it is really a ‘con amore’ affair, fuelled by their passion for Copenhagen’s bicycle culture and cargo bikes. The idea to revive the historical Svajerløb started in 2009 when Erik Heinze (Firmacyklen.dk) and Hans Bullitt Fogh (Larry vs Harry) held the first modern version of the classic race. Together with Mikael Colville-Andersen (Copenhagenize.com) and Søren Houen Schmidt (Rekommanderet), they form the nucleus of the team behind the Svajerløb. 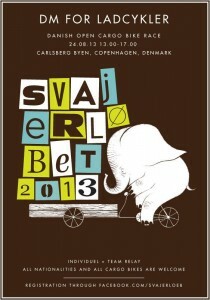 Svajerløb 2013 is also supported by Carlsberg City, The City of Copenhagen, Tombola CPH, the Danish cargobike team ‘Team Bullitt Hangover Copenhagen’, Bicycle Innovation Lab and an army of passionate volunteers. We hope to see as many participants and spectactors as possible to create a memorable day.